May is ending up being a fabulous month! The weather was gorgeous and I had the Wag a Thon for Guiding Eyes for the Blind to work towards which kept me quite motivated (and for a great cause)! But unfortunately after I got all my miles in for the Wag aThon, I kind of lost my "purpose". 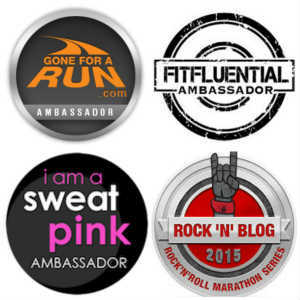 So I guess that's where I will start my first Runfessions. At last year's 4th of July 5k. I Runfess that I finally signed up for some summer races. I am once again going to run the Monumental Mile race in support of the Veterans and I'm also signed up to run the dread 4th of July race that is hotter than Hades. Why do I do that to myself? Speaking of Monumental Mile, I Runfess that I am a bit irritated with this race organization (just a bit). When I signed up for the inaugural race last year the cost was only $12. I believe I signed up in May or maybe April at the earliest but not before that because I didn't even know about the race. I think I may have even had a discount code so it may have ended up being less than the original $12. It was a good deal! Well, When I went to sign up for the race this year, I missed the $12 registration. You had to register back in February to get in for $12. By the time I thought to sign up, it was already up to $17.50 and it will keep going up till race day when it is $20. 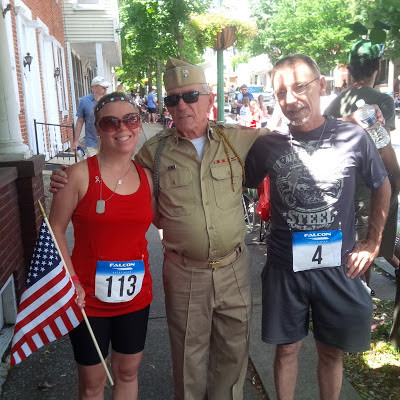 Last year with my Pap and Dad at the Veteran's Monumental Mile. I also Runfess that I have lost my race buddy for the summer. My dad had shoulder surgery this week so unfortunately he won't be running the Monumental Mile with me like he did last year. My dad likes to bike as well as run so I Runfess that I have my eye on a bike race for us to do later in the summer. I think having goals really helps me stay focused and on track. It's too bad that your dad won't be able to run with you this summer, but biking sounds perfect. It definitely helps to have races on the agenda to stay motivated. I hope your dad can get back to biking and running with you soon! I have definitely had the same experience - lost my motivation after a big race. I have never done a mile race, but I was just thinking about trying to find one on my area. The thought of racing all out for just a mile is appealing. Have fun biking with your dad! Most of the races I do require super early sign up, but it's so frustrating. It's hard to commit that early. I was feeling blah about running after my half last weekend, but our weather has been gorgeous, so that's motivating me again! Sending well wishes to your dad and hoping that his recovery goes well! I can definitely see why you would be irritated with the race organization about the increase in prices. I definitely felt a loss of purpose once my marathon was completed. I have no idea what to do next! I still have never run a July 4 race and I always claim that I will find one. Maybe I should start checking now, hopefully it wont' be too pricey! I remember (in the dark old ages of running lol) complaining loudly when the price of the LA Marathon went up to about $45! That was in the 90s. Sounds pretty cheap compared to the $180 or whatever it is now! I totally need a race or two on my schedule to motivate me to train. Otherwise, I'd still run but it would just be short and slow! Bummer you missed the price cut off! At least it is for a good cause? I'm glad you and your dad will still possibly get to race together this summer, albeit on a bike! Were your parents active while you were growing up? Is that what sparked you and your sister's love of running/biking/etc? summer races are always tough with the heat and humidity. But they are lots of fun! There's a 4th of July race near me, but I'm always worried about how hot it'll be. Colorado is much better than Texas, but temps can still warm up quickly here in the summer. Hope your dad is recovering. Shoulder surgery aint fun at all! That's too bad about your Dad, but nice that you can still bike with him. My parents played tennis & golfed . . . and I did neither. Actually, they just never taught me to golf, although they taught my siblings. Because I'm not the athletic one. Maybe it's a good thing, it's so expensive! I do a race on the 4th every year. Yes, it's typically really hot but I also really enjoy the race & there's great spectator support -- I signed up months ago! Speedy recovery wishes to your dad! 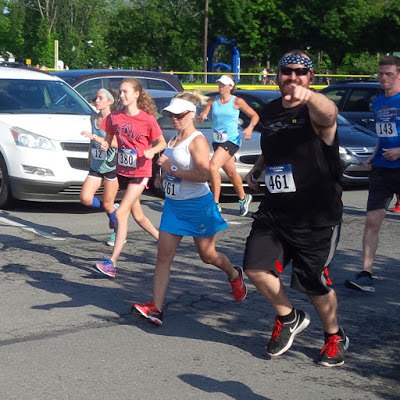 I've actually signed up for a couple of summer races this year and am starting to question my sanity given how I feel about running in the heat! I think a bike race with your Dad is an excellent idea! Why do you keep signing up for the hotter than hades races? Thanks for the linkup! 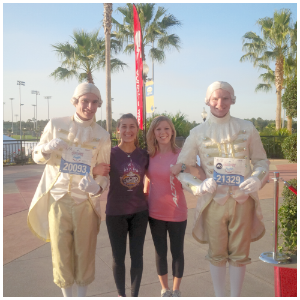 I hear you on the race entry fees - it's getting so $30 is common for a 5K around here! I get pretty picky with my races because of that. Hope you have a great weekend! I am planning to run a race (4 miles) on July 4th. I've been running it for a few years and love the distance. Here's to a speedy recovery for your dad! Biking with him will be fun too. I get pretty ticked as well when I miss the signup and get hit with a price increase. No bueno!